Gatekeeper documents the suicide prevention efforts of a retired Japanese detective named Yukio Shige. Yung Chang is a Chinese-Canadian filmmaker best known for his feature-length documentaries Up the Yangtze and China Heavyweight, both of which won Golden Horse Awards (the Chinese-language equivalent of the Oscars). This year, Chang has come out with Gatekeeper, a 39 minute documentary short (which you can watch for free below thanks to Field of Vision) set in the seaside town of Tojinbo — one of Japan’s most popular suicide destinations. In the film, Chang focuses on a retired police detective named Yukio Shige, who runs a non-profit that aims to prevent suicides at Tojinbo. 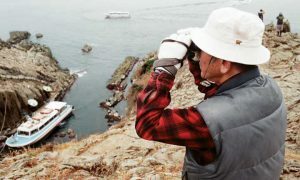 Through a combination of cliffside patrols, informal counseling, and a cafe that serves Japanese rice cakes (oroshi mochi), Shige and his volunteers have saved over 500 lives since 2004. Gatekeeper delves into Shige’s motivations and captures how he and his volunteers touch the lives of those who go to Tojinbo to contemplate life and death. 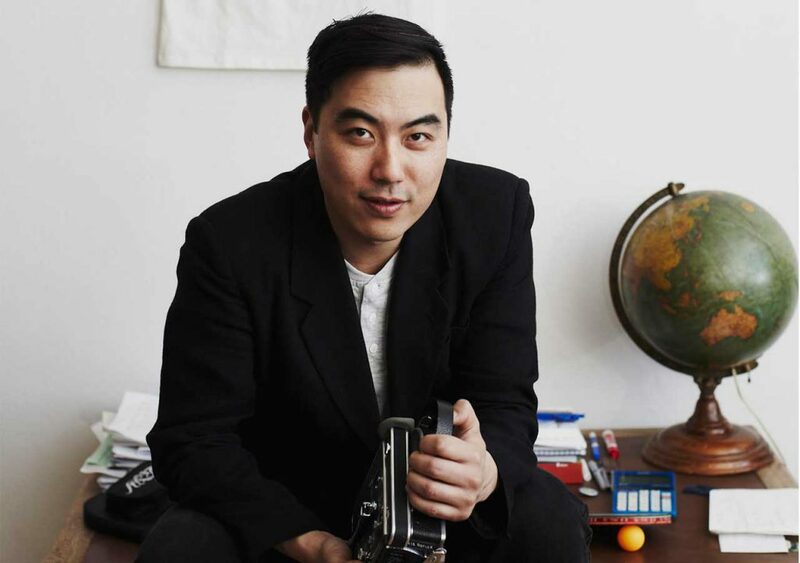 Chang talked with Cinema Escapist about his experiences directing the documentary and also shared thoughts on how having a Chinese-Canadian “hyphenated identity” influences his filmmaking. What inspired you to make Gatekeeper, and how did you come across Shige? Interesting you say that. I read in an article from Japan Daily that Shige has received quite a few filming requests. To what extent is him willing to appear in so many pieces a part of wanting to get a message out, and absolving that guilt? Yeah, Shige’s very welcoming for anyone who wants to do anything about suicide prevention. He’d say he’s one of a handful of people who are trying to reposition the notion of suicide in Japanese culture. So he’s quite open to media, and expounding on his nonprofit and the work they do — though I’d say surface reports on him wouldn’t dive into the deeper aspects of his character. For Gatekeeper though, I wanted to focus on the man himself, and what could compel someone to do this work every day. You can’t allow yourself to think that somebody might die if you’re not there to save them — and thus beyond the residual pain of guilt, there’s a sense of optimism too. 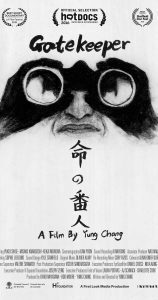 While we’re discussing the man himself, could you talk a bit about the film’s title, because I’m assuming Shige’s the “gatekeeper” that it refers to. Correct, I thought it was a pretty appropriate title. In Japanese, I believe the title (命の番人) even directly references the gatekeeper between heaven and hell. In English, “gatekeeper” refers to this idea that, according to Shige, people come to Tojinbo to contemplate both life and death. His view was that it’s probably easier to kill yourself at home — so why would someone drive hours to a remote destination on the coast of Japan? They don’t actually go there with the confirmation they want to kill themselves. They go there to think about it while looking at the beautiful landscape. For Shige, that creates a window of opportunity where someone’s on a threshold between life and death. If he, or one of his volunteers, can step in at that moment, they can save someone. And that’s how he’s a gatekeeper. While shooting this film, your crew must’ve not only been watching Shige, but also looking out for potential suicide cases. To what extent do you feel you and your crew became “fellow gatekeepers” in the process? Shige keeping watch over the Tojinbo cliffs. We totally became paranoid with that notion. The truth is that we were such novice “gatekeepers” that the more we filmed, the more we became obsessed. Over a month we filmed Shige endlessly, and while we were quite aback from the action using zoom lenses, we’d still spot someone and go “oh my god, this could be a potential attemptee.” This is because we’d learned certain things Shige looks for: someone walking alone outside the tourist path, someone who’s not carrying a bag, someone who’s lightly dressed, someone who looks morose. Unfortunately, that could almost describe everyone we encountered — so I quickly realized there is really a finer skill that Shige and his volunteers that have learned by doing this day in and day out, and we weren’t able to get it right. But we certainly felt a pressure to, which helped us as filmmakers become more deeply obsessed with our work. Did you come into this project knowing roughly what kind of story you wanted to tell? If so, how did that shape your filming? However, when shooting in production, I let much of this go and tried to be as open and present as possible. Anything can happen in a documentary; essentially you’re improvising. But it helps to go into it with a tacit idea of where to train your camera and what details are important. Ah yes, I have to admit I didn’t notice the “single day” structure the first time I watched Gatekeeper but, when you do realize it, it’s quite powerful. Yeah, it was important to me that you wake up with Shige, and then we end at dusk. What you end up seeing is how a day in the life of Shige operates at its most climactic. There are drop-ins with people he’s saved, like the character in the opening of the film. There are moments of intense patrolling, but then moments of quiet as well. 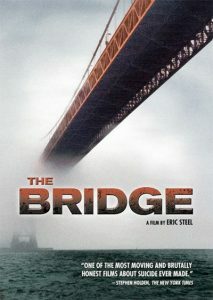 Have you heard of The Bridge, which is a controversial 2006 documentary about suicides on the Golden Gate Bridge? It takes a different approach from Gatekeeper in capturing actual suicides and their aftermaths, but I’m curious if it influenced your thinking. I have seen it, and it definitely has different observations about suicide. With that story, I think it’s much more about the bridge, not a gatekeeper. I was moved by that film with its stories of the survivors and victims of suicide, and by victims I mean the friends and families left behind. It was a way of understanding and thinking through what suicide meant. For me, The Bridge also brings up a question of how to film suicide. In Gatekeeper, I never thought I’d capture someone leaping to their death (like The Bridge does). I always had the confidence that I’d capture Shige saving someone. Maybe that’s a testament to my naïveté, but underneath there was a moral question: what would I do if I did film someone committing suicide? I think I would’ve stopped filming if I even thought it would happen. Ultimately Shige was the barometer. We captured five full interactions over our month of filming, and Gatekeeper includes two that we were able to get releases for — the survivor who comes to visit during an emergency, and the boy with the backpack. Shige helped get permission; if he felt someone would be protected, I’d feel confident too. Something else I want to add — there’s a theory that people only commit suicide between sunup and sundown in Tojinbo. People don’t do it during off hours, so Shige’s cafe only operates from 9am-5pm each day. People don’t do it on Wednesdays either, which is the the cafe’s day off. The most popular days are after the weekend on Mondays and Tuesdays; few people attempt suicide on the weekend or Thursday and Friday. It’s remarkable the statistical evidence Shige has collected over the years about all this. Wow, that’s quite remarkable indeed. Does that mean most people who know about Tojinbo are also very much aware of Shige’s non-profit and cafe? No, not everyone. The majority of people aren’t aware of Shige. They’re only aware of Tojinbo’s reputation as a suicide spot. There’s a macabre mythology to the area too. There’s this myth I heard, which turned out to be false, about a monk committing suicide there; apparently he was actually thrown to his death by villagers upset with his policies. But I also believe what Shige told me: that Tojinbo is haunted, and that he’s had these supernatural experiences despite being this grounded and pragmatic former detective. He’s heard voices like a woman screaming for help at sunset and children crying, but realized they were just phantoms after going out to look for them. This really speaks to Japan’s spiritual culture, and certainly speaks to the area’s mystique. Your most well-known films (Up the Yangtze, China Heavyweight) focus on China, and you come from a Chinese background. Gatekeeper is obviously not set in China. Did you make a conscious choice to tell a story from somewhere different? Yes. I’d actually heard about a Chinese gatekeeper in Nanjing on the Nanjing River Bridge. He was interesting, but I didn’t quite feel compelled to make a film. Besides, I later realized there were a bunch of other movies being made about this Nanjing gatekeeper anyways. Yung Chang sampling fruit while making The Fruit Hunters. What really drives me is the story — these narratives that, when I discover them, give me this “punch in the gut” feeling. If there was a gatekeeper from San Francisco who had a great story, maybe I’d have made a film about him. 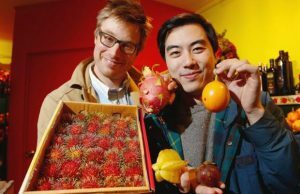 I mean, I made a film called The Fruit Hunters because I like fruit, and it took me all over the world and let me try lots of exotic fruits. That was quite an experience! But obviously I’ll always have some connection back to my roots and Chinese films. While I do try to veer towards compelling stories rather than just focusing on locations, at times I will return back to Chinese subjects. Is it easier making films about China as someone who comes from a Chinese cultural background? It’s partially about that connection and familiarity. But I’d have to say that China is just a fascinating place. There’s endless conflict and stories, and the dichotomy of the stories you can discover in China are much more inspiring than those I can find in my own backyard of Montreal. There’s also a deep-seated need to connect and reconnect with my history, culture, and relatives. That’s why I like going to and working in mainland China and, hopefully in the future, places like Taiwan and Hong Kong. I realize that, as a filmmaker, stories about or in China do get my juices flowing more than anywhere else. To what extent do you feel integrated with the world of Chinese film then? I know you’ve won Golden Horse Awards, have interviewed with Chinese press, and I can even toggle to a Chinese version of your personal website. Yung Chang with Qi Moxiang, the boxer at the center of China Heavyweight, at Sundance 2012. I love going to mainland China because I feel very accepted there. As an overseas Chinese, I feel that they embrace me and I am part of the culture. When I made China Heavyweight I felt that I’d truly made a Chinese film, and it was certainly represented as such in mainland China — which was wonderful. There’s a slight chip on my shoulder outside mainland China because it’s difficult for people to define you when you’re a hyphenated filmmaker. As a Chinese-Canadian, when I make a film about China it’s not “authentically Chinese” according to certain Westerners and film festival programmers, and that detracts from the film. I feel like I’m not a Western filmmaker making films about China. Rather, I feel like I’m a Chinese with an “outside-inside” perspective. That’s something I wish to keep pushing as an identifier. There’s probably lots of filmmakers descended from Chinese culture, or any other non-North American culture, who have a connection to their homeland and thus can argue they have a unique voice, and potentially deeper perspective, on that culture. Any plans for future films? Yes. I’m working on a Chinese feature film called Qiezi (“Eggplant”). It’s film noir love story about a grifter who meets a pre-wedding photographer. This is a film I workshopped at the Sundance Institute last year, and that experience was great in helping to inform the craft of feature narrative filmmaking. I feel pretty good about applying my documentary background to feature narratives. This film will hopefully be both interesting and moving. I’m in the script phase and am hoping it’ll come together by next year in production. Enjoyed Gatekeeper or our interview? Support Yung Chang and help Cinema Escapist pay for web hosting by buying some of his films with our affiliate links. There’s no extra cost for you!